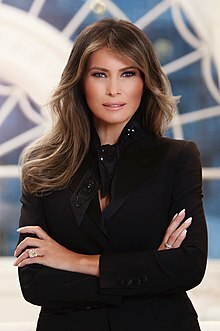 The First Lady of the United States is the wife of the President of the United States. If the President is not married, or his wife is unable to do the jobs of First Lady, a family member such as daughter or sister usually is considered the First Lady. The current first lady is Melania Trump. Some famous former first ladies include Martha Washington, Abigail Adams, Dolley Madison, Mary Lincoln, Edith Wilson, Lou Hoover, Eleanor Roosevelt, Jacqueline Kennedy, "Lady Bird Johnson", Betty Ford, Rosalynn Carter, Nancy Reagan, Barbara Bush, Hillary Clinton, Laura Bush and Michelle Obama. The First Lady is not chosen by the people of the United States, and there are no jobs she is officially required to perform. Though she is not paid for being the First Lady, her role includes involvement in political campaigns, management of the White House, championing social causes and representing the President at official and ceremonial occasions. First ladies have focused on different causes and have had a strong influence in a range of sectors, from public opinion on policy to fashion. As of April 17, 2018, there are four living former First Ladies, as seen below. This page was last changed on 22 April 2019, at 01:14.